Right-angled plug enables a flat panel TV to be mounted flush to the wall. digital signage, education and consumer flat panel televisions can be mounted closer to the wall because the flush right-angled plug does not stick out as a far as a traditional power cord. 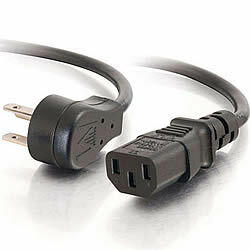 Plus this heavy-duty 18 AWG cord features a fully molded design for maximum durability and long life.